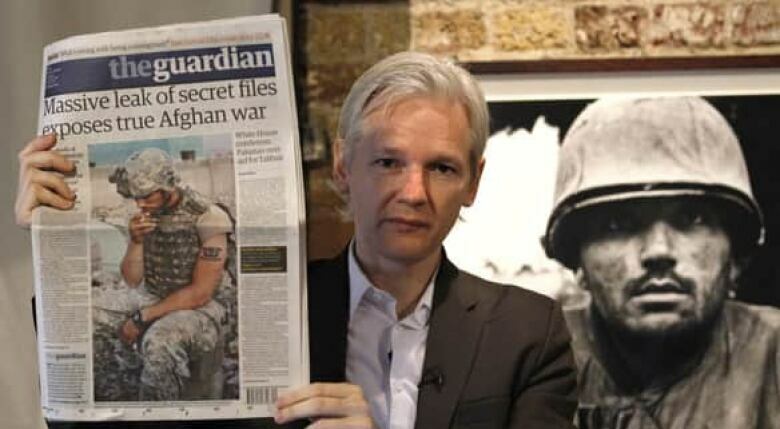 More than 91,000 secret U.S. military and intelligence documents about the war in Afghanistan were leaked online by the whistleblowing website WikiLeaks this week. Here's a roundup of what media outlets have reported so far. 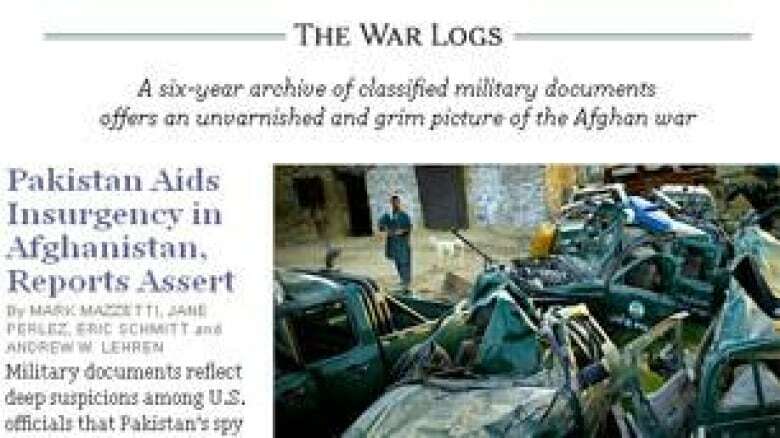 Nearly 77,000 secret U.S. military and intelligence documents about the war in Afghanistan are now in public view, after they were leaked online by the whistleblowing website WikiLeaks this week. WikiLeaks plans to publish another 15,000 documents soon, bringing the total released to 92,000. 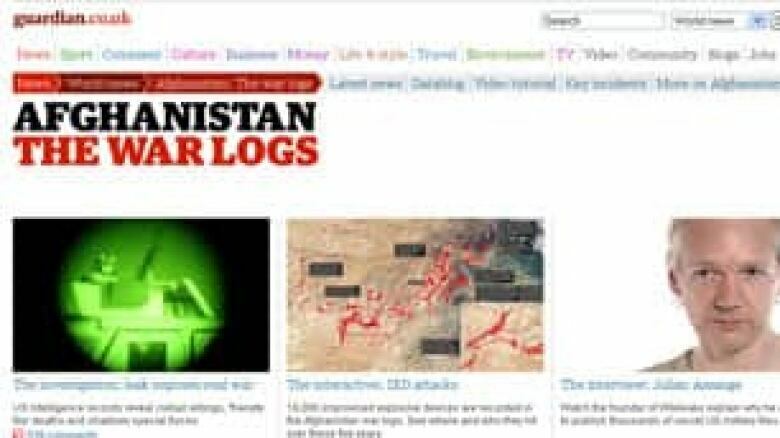 Leak of Afghan war logs condemned by U.S. The leaked documents — spanning a period from January 2004 to December 2009 — reveal a close relationship between Afghan insurgents and the Pakistani military, as well as numerous accounts of brutality, corruption, extortion and kidnapping committed by members of the Afghan police force. As well, the documents reveal allegations that the Taliban used heat-seeking missiles to down a helicopter in 2007, possibly killing a Canadian soldier. The New York Times and Guardian newspapers were given early access to the records, as was the German weekly Der Spiegel. "Pakistan, an ostensible ally of the United States, allows representatives of its spy service to meet directly with the Taliban in secret strategy sessions to organize networks of militant groups that fight against American soldiers in Afghanistan, and even hatch plots to assassinate Afghan leaders." A small selection of the documents, posted on the Times website, include a threat report about Gen. Hamid Gul, a former director of Pakistan's Inter-Services Intelligence, providing "strategic advice" to the Afghan Taliban in January 2009. Gul has denied the allegations, telling Al-Jazeera in an interview that the "flawed" documents' sources had ulterior political motives. The Times also reported that the U.S. has spent about $1 trillion on the Afghanistan and Iraq conflicts to date, "second only in inflation-adjusted dollars to the $4-trillion price tag for World War II, when the United States put 16 million men and women into uniform and fought on three continents." The newspaper concludes that "over all, the documents do not contradict official accounts of the war" in Afghanistan, but they do "show that the American military made misleading public statements — attributing the downing of a helicopter to conventional weapons instead of heat-seeking missiles or giving Afghans credit for missions carried out by Special Operations commandos." The Guardian's special section on the leaked U.S. military logs. The British newspaper selected about 300 of the secret documents to profile on its website, plotting "significant incidents" on an interactive map. "Some of these casualties come from the controversial airstrikes that have led to Afghan government protests, but a large number of previously unknown incidents also appear to be the result of troops shooting unarmed drivers or motorcyclists out of a determination to protect themselves from suicide bombers. "At least 195 civilians are admitted to have been killed and 174 wounded in total, but this is likely to be an underestimate as many disputed incidents are omitted from the daily snapshots reported by troops on the ground and then collated, sometimes erratically, by military intelligence analysts." The newspaper also notes that the Taliban have succeeded in using IEDs — improvised explosive devices — as an "indiscriminate terror weapon" to not only strike at foreign troops, but also to harm and kill thousands of civilians. "The soaring number of attacks by these increasingly powerful homemade bombs can clearly be seen to be focused in the southern and eastern provinces. "In 2004, according to the logs, there were 308 makeshift bombs; last year there were 7,155. Taliban fighters in total planted more than 16,000 IEDs in those five years." An interactive map shows where those bomb attacks took place and who was killed as a result. Der Spiegel's main story on the military document leak. The German magazine accuses that country's military of being "helpless" in Afghanistan, where it has been since 2002. "Countless reports in the war logs describe how the Afghan police and army in the north are bitterly fighting an enemy that is constantly advancing. In these clashes, German soldiers usually serve, at most, as advisers or medics tending to the wounded in field hospitals. "The number of Afghan security forces wounded or killed exceeds the German casualty count by far. It demonstrates that Afghanistan's armed forces are still a long way from being able to pacify the country, and that Afghanistan is in fact perilously close to the brink of a new civil war. "The numbers also illustrate something else as well: How little the Germans have achieved." The magazine also calls German forces naive for assuming they would not be threatened by insurgent forces. "The Germans thought that the northern provinces where their soldiers are stationed would be more peaceful compared to other provinces and that the situation would remain that way. "They were wrong. As far back as the end of 2005, resistance against the international troop presence began to grow — locals were either threatened by the Taliban and powerful warlords or their support was bought." The New Yorker's Amy Davidson questions the Times' conclusion that "over all, the documents do not contradict official accounts of the war." Washington Post columnist Eugene Robinson says the documents "fail to shock," but instead bolster the argument that "we are wading deeper into a long-running, morally ambiguous conflict that has virtually no chance of ending well." The U.S. ex-hacker who turned in Pte. 1st Class Bradley Manning, the believed source of the leaked documents, tells the Daily Beast he thinks others were also involved. Cybersecurity experts say the release of so many secret military documents "highlights the security challenges of the digital age, when gigabytes of stolen data can be shared with one click," AFP reports. In a July 20 interview with TED.com, WikiLeaks founder Julian Assange reveals how his website operates and what it has accomplished. Assange says more secret documents will be made public as his team works through a backlog and anticipates more submissions from other whistleblowers. An earlier version of this story said more than 92,000 secret U.S. military and intelligence reports were published on the website WikiLeaks on July 25. In fact, WikiLeaks published nearly 77,000 documents on July 25 and planned to later publish about 15,000 more.